Update, September 24, 2018: In a move that surely no one saw coming, the Maine Health Inspection Program is investigating a restaurant’s practice of getting lobster high on marijuana before cooking and serving them to diners. The Portland Press-Herald reports the eatery, Charlotte’s Legendary Lobster Pound, has not been shut down but has temporarily stopped serving lobster “sedated” via this method. Owner Charlotte Gill says she’ll have to make some updates to her methodology, but is confident she’ll be back to serving these erm, baked lobsters by mid-October. Lobster meat is delicious, but as we’ve discussed, getting a live lobster from tank to plate isn’t one of our favorite activities. It’s hard not to feel bad for the spiny crustaceans, which is what motivated Maine restaurant owner Charlotte Gill to employ an unorthodox, “humane” method at her eatery: she says the kitchen gets the lobsters stoned before killing them. 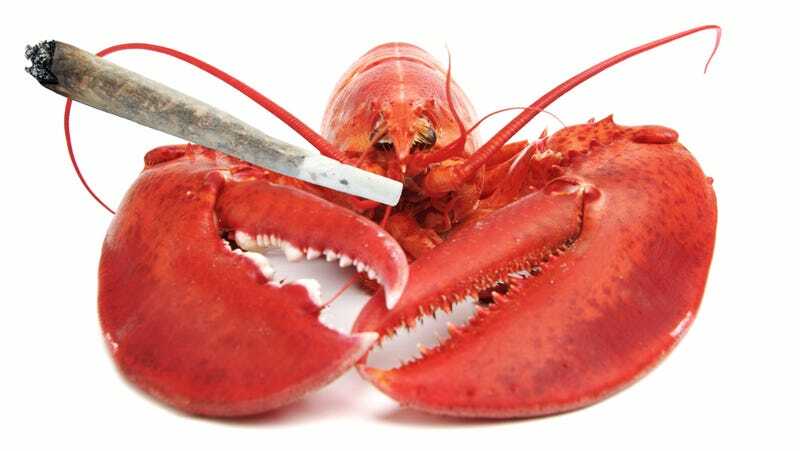 Anyway, the restaurant has for a few months been offering guests the option to have their lobster prepared normally or sedated with marijuana before cooking. Gill says there are no residual THC effects in the meat itself because the lobsters are prepared by heating them above 420 degrees for an extended period of time; she says THC breaks down completely at 392 degrees. Again, I’m no biologist, but don’t substances in water concentrate in crustaceans? Just posing the question. The restaurant, for its part, swears the lobster meat is better-tasting if it’s been sedated before cooking. I’m trying hard to reserve judgment about this, given I’ve never tried a “sedated” lobster nor taken a crustacean-focused science class. But as a person who loves words, I do have the authority to say it’s a crying shame they didn’t try this first with stone(d) crabs.